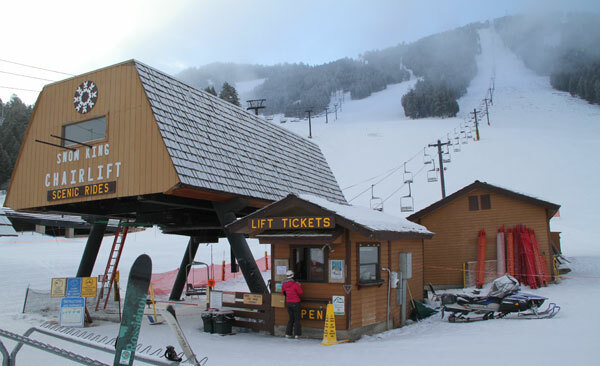 Snow King is the original Jackson Wyoming ski resort, opened in 1939 – long before Jackson Hole in 1996 and Grand Targhee in 1969. Snow King’s steep ski slopes can be seen from the streets of Jackson, just six blocks from Town Square and the Elk Arches, tempting you to come make some turns – there’s even night skiing. Snow King is not fancy, a new fixed grip quad for 2015, plus a double and a triple serve a dozen runs, much of the 1,571′ vertical is steep with a 40% slope. This is where the locals race, it is the steepest ski area in the country. Snow King’s summit trails from 7,808’ are all black diamond trails from the top, like Bearcat and Grizzly, live up to their names, steep and deep and untouched by groomers. You can also access backcountry terrain from Snow King – but don’t wonder too far into the wildlife corridor and elk refuge. But there are green and blue runs on Snow King’s lower mountain covered in snowmaking, a terrain park, a tubing hill and ice skating rink. Snow King is a steal at $25 for a two-hour ski ticket – you can get plenty of skiing and riding on the un-crowded ski hill. Snow King Resort has condo and hotel lodging at the base, and anew look next winter, very family oriented and friendly, and you can walk to the town of Jackson. Summer at Snow King brings mountain biking, mini-golf, an alpine slide and hiking the slopes. While you are ski vacationing in Jackson, consider staying and dining in town at The White Buffalo Club, or on the hillside overlooking the Grand Tetons at the elegant Amangani Resort, or at Teton Village’s slopeside Four Seasons Jackson Hole.